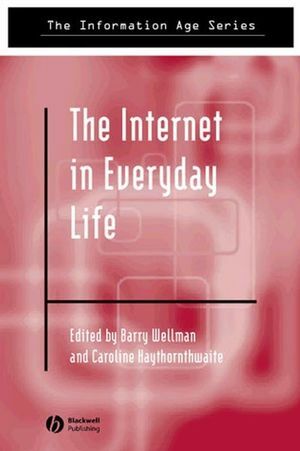 The Internet in Everyday Life is the first book to systematically investigate how being online fits into people's everyday lives. Opens up a new line of inquiry into the social effects of the Internet. Focuses on how the Internet fits into everyday lives, rather than considering it as an alternate world. Chapters are contributed by leading researchers in the area. Studies are based on empirical data. Talks about the reality of being online now, not hopes or fears about the future effects of the Internet. Barry Wellman learned to keypunch in 1965 and started chatting online in 1976. Now the head of the University of Toronto's NetLab, he's a leading scholar of cybersociety, community, and social network analysis. Prof. Wellman has pioneered understanding of both communities and computer networks as social networks. He founded the International Network for Social Network Analysis, chaired the Community section of the American Sociological Association, and serves on the Executive Committee of the Association for Internet Research. He's written more than 200 articles and edited two other books. His website has received 20,000 hits in three years. Caroline Haythornthwaite is a faculty member at the Graduate School of Library and Information Science, University of Illinois at Urbana-Champaign, where she is also Coordinator of the Undergraduate Minor in Information Technology Studies. Before returning to full-time study, she spent over 10 years in software development as a programmer, systems analyst, and software development manager. Her research focuses on how people work and learn together at a distance via computer technology and the Internet, and examines what combinations of computer media, and work and social communications build ties and social networks online. Current projects include examination of learning networks and community ties among distance learners, and processes of knowledge co-construction among members of distributed research teams. Foreword: The Virtual Community in the Real World. (Howard Rheingold). Series Editor's Preface: The Internet and the Network Society . (Manuel Castells). Introduction: The Internet in Everyday Life. (Caroline Haythornthwaite and Barry Wellman). Part I: Moving The Internet Out Of Cyberspace. The internet in Everyday Life: An Introduction. (Caroline Haythornthwaite and Barry Wellman). Part II: The Place Of The Internet In Everyday Life. 1. Days and Nights on the Internet. (Philip Howard, Lee Rainie, and Steve Jones). 2 The Global Villagers: Comparing Internet Users and Uses Around the World. (Wenhong Chen, Jeffrey Boase and Barry Wellman). 3 Syntopia: Access, Civic Involvement and Social Interaction on the Net. (James Katz and Ronald Rice). 4 Digital Living: The Impact (or Otherwise) of the Internet in Everyday British Life. (Ben Anderson and Karina Tracey). 5 The Changing Digital Divide in Germany. (Gert Wagner, Rainer Pischner and John Haisken-DeNew). 6 Doing Social Science Research Online . (Alan Neustadtl, John Robinson and Meyer Kestnbaum). Part III: Finding Time For The Internet. 7 Internet Use, Interpersonal Relations and Sociability: A Time Diary Study. (Norman Nie, D. Sunshine Hillygus and Lutz Erbring). 8 The Internet and Other Uses of Time. (John Robinson, Meyer Kestnbaum, Alan Neustadtl and Anthony Alvarez). 9 Everyday Communication Patterns of Heavy and Light Email Users. (Janell Copher, Alaina Kanfer and Mary Bea Walker). Part IV: The Internet In The Community. 10 Capitalizing on the Net: Social Contact, Civic Engagement and Sense of Community. (Anabel Quan-Haase and Barry Wellman). 11 The Impact of Computer Networks on Social Capital and Community Involvement in Blacksburg. (Andrea Kavanaugh and Scott Patterson). 12 The Not So Global Village of Netville. (Keith Hampton and Barry Wellman). 13 Gender and Personal Relationships in HomeNet. (Bonka Boneva and Robert Kraut). 14 Belonging in Geographic, Ethnic and Internet Spaces. (Sorin Matei and Sandra Ball-Rokeach). Part V: The Internet At School, Work And Home. 15 Bringing the Internet Home: Adult distance learners and their Internet, Home and Work worlds. (Caroline Haythornthwaite and Michelle Kazmer). 16 Where Home is the Office: The New Form of Flexible Work. (Janet Salaff). 17 Kerala Connections: Will the Internet Affect Science in Developing Areas?. (Teresa Davidson, R. Sooryamoorthy and Wesley Shrum). 18 Social Support for Japanese Mothers Online and Offline . (Kakuko Miyata). 19 Shopping Behavior Online. (Robert Lunn and Michael Suman).